This year at Gritty Movement, we wanted to stop and take a moment to redirect some of this holiday season craziness towards a kinder and less materialistic theme. What better way to do that than by reaching out and helping others that have the same kind of passion and love for women and leadership as we do? You already know that our goal is to help female founders make their impact on the world by maximizing the greatest resource - People! With that said, we are also committed to mentoring and supporting the next generation of strong women. Here are three amazing nonprofit organizations that are doing magical things in the realm of building young women up in life and leadership. Girl Rising is a empowers at-risk girls to recognize their value and pursue higher goals through a community of women mentors. Girls Rising pairs each girl with an individual mentor to serve as a positive, consistent role model in their lives. In addition, they offer several social, educational, and character building events throughout the year to promote a sense of community, increase social support, and introduce the girls to new experiences. Upon entering the program, every girl sets personal goals that her Big Sister helps her achieve. If you didn’t already know, Gritty Movement already donates 5% of all proceeds to Girls Rising, but if you’d like to get in on a personal level, click here to get involved! Girls Who Code is a nonprofit organization focused on building the largest pipeline of future female engineers and closing the gender gap in the United States. They offer learning opportunities to deepen computer science skills, as well as confidence, in young girls across the nation. They also pride themselves on building a supportive sisterhood of peers and role models who help out in their vision for persistence and success. Their firm belief that computing skills are a critical path to security and prosperity in today’s job market fuels their expansive reach of almost 40,000 girls by the end of this year. Get involved and/or donate to Girls Who Code here! She Should Run provides an approachable starting place and network for women leaders considering a future run for office and for those who support them. Their mission is to expand the talent pool of women running for office in the United States by providing community, resources, and growth opportunities for aspiring political leaders. They believe women of all political leanings, ethnicities, and backgrounds should have an equal opportunity to lead in elected office and that our democracy will benefit from the varied perspectives and experiences that women bring to leadership. Fun fact? Women are underrepresented at all levels in the 500,000+ elected offices across the U.S. That is why She Should Run is committed to getting at least 250,000 women to run by 2030! Help them get to 250k in 2030 here. What are some of your favorite female empowerment focused nonprofits? How are you and your team giving this year? 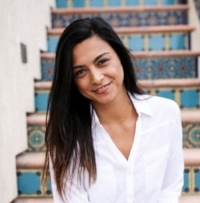 Jessica Miranda, an Organizational Development Psychologist, has 8 years of leadership and coaching experience in the corporate and tech start up spaces in Silicon Valley and greater Los Angeles areas, as well as active military enlistment. She completed graduate schooling at the University of Southern California and specializes in employee engagement and cultural development with an emphasis on Millennials and following generations in the workplace.